It has a National Semiconductor logo. They didn't have modern memory chips in such housings AFAIR, but it is maybe something like a LVDS / HDMI / SerDes chip. They also did a lot of custom chips for e.g. Tektronix. Anyone know what this is? It is from a 3.3V fan motor PCB which was probably damaged by applying a higher supply voltage. It appears to have an H bridge output since there is only 2 wires coming out of the windings (no center tap) and uses an external 4 pin hall effect sensor. Pinout appears to match. I'll investigate further to double check. thanks! 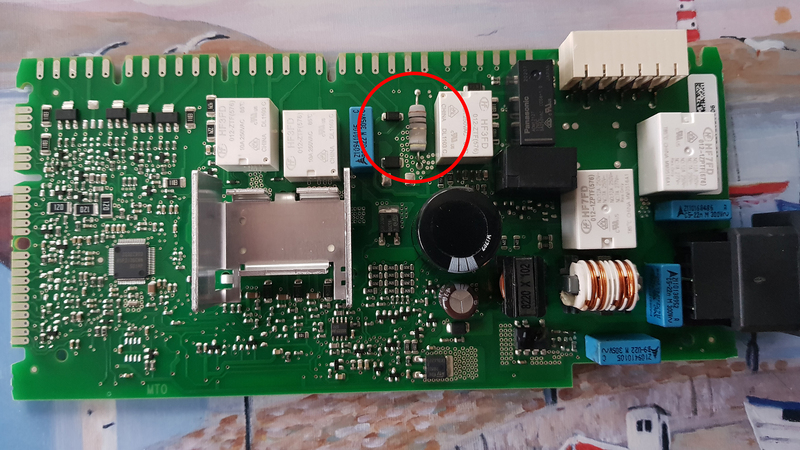 This piece of RF junk has been in my junk box for the longest time, and I would like to know what it is before I throw away something that I could use. Its potted in epoxy inside and kind of a black box for that reason. The leftmost connector measures 0.22 ohms from center to ground, so does the bottom middle one, while the rightmost SO-238 measures approximately twice that, 0.44 ohms at DC. Left to center's center is 0.16 and right center to center's center is 0.25 approximately. Its tarnished so its not very accurate a measurement without using a PL-259 which I don't have handy, right here. It's around 0.22 straight through. Because its potted I doubt if it is just a y-connector. Spectrum analyzer or VNA to confirm. Might be some kind of transformer. You'd have to test it with some MHz of signal frequency to get useful results. VNA helps as tautech said, function gen and scope should also give some results. It's HM Electronics. They make intercom and audio systems. Could someone clarify as to whether I'm reading this resistor correctly please, the last yellow band is throwing me a bit. I can't test it as the resistor has gone open. I've had a dig around and am thinking that it's just a 4 band 10Ω resistor with an extra 5th band denoting it's temperature coefficient. Would this be correct or not? I think you're right about the nature of the bands, but not necessarily about the value. The 2nd and 3rd bands don't look the same color to me, but then I'm only looking at a picture plus my red-green vision isn't the best. If the 3rd band is actually green, that would be a 1MΩ resistor. What was the application of the circuit in question? You may be able to determine what value makes more sense. The 5th band could also indicate a fusible resistor (the color is vendor specific). 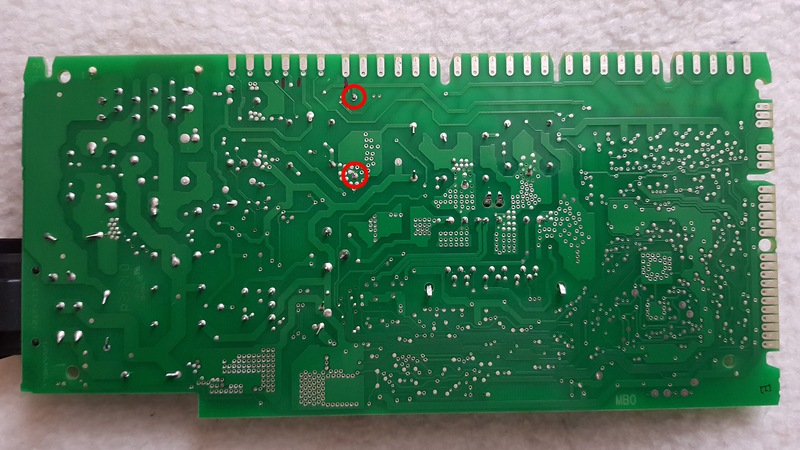 Here are some hopefully helpful pics in ID'ing the resistor a little better?.. Not 1M then. I found this page with what appears to be the same failure on the same board, which is apparently common to multiple brands/rebrands of dishwasher. Fusible resistor seems to be correct. Readable if you run it through google translate or equivalent. Hope it helps you. Ah that's brilliant.. Ive got something to go on now. Saw this on ebay. Any ideas? Appears to be a 1990s era water-cooled mainframe CPU assembly. 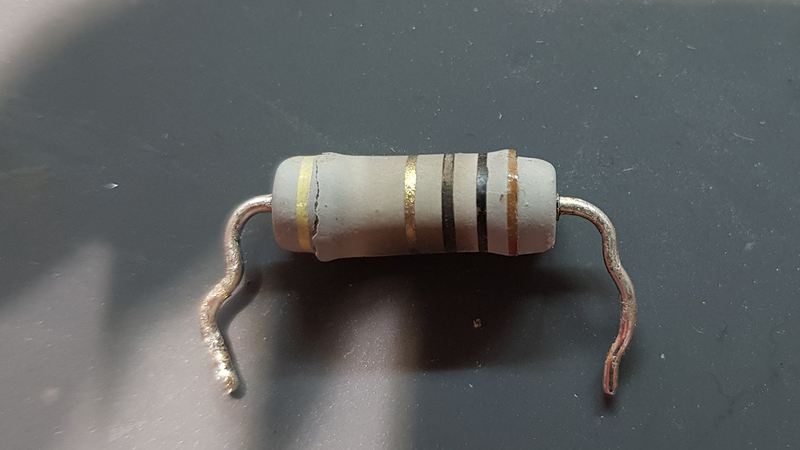 It is clear what this component is (Neutrik NTE1 transformer), so maybe this doesn't belong here. But the question is regarding the schematic diagram for this transformer. We know what the dots at the "top" of the primary and secondary winding mean. But what does the dot in the middle of the secondary winding indicate? I don't remember ever seeing such a thing before. More likely that they cribbed that diagram from a transformer with a centre tap (like Neutrik NTE-10/3), but somebody forgot to remove the dot. I don't suppose anyone knows what this is? I think I pulled it out of a brother printer (It also might have been a computer not 100% sure), but I have forgotten exactly where it was. High voltage transformer from a laser printer.